guruparamparai hindi – vangi puraththu nambi – life and glories in hindi – https://guruparamparaihindi.wordpress.com/2015/05/08/vangi-purathu-nambi/ – new article by bhagavathi ammangar based on http://guruparamparai.wordpress.com/2013/04/10/vangi-purathu-nambi/ . Please visit https://guruparamparaihindi.wordpress.com/2013/08/29/introduction-2/ to see the full list. 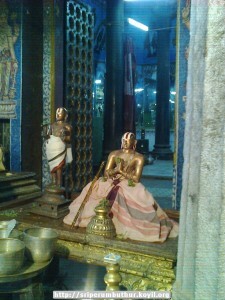 pinbhazhagiya perumAL jIyar – life and glories in telugu – https://guruparamparaitelugu.wordpress.com/2015/05/06/pinbhazhagiya-perumal-jiyar/ – new article by chUdAmaNi ammangar based on https://guruparamparai.wordpress.com/2013/04/21/pinbhazhagiya-perumal-jiyar/ – published by raghuvamsi swamy. Please visit https://guruparamparaitelugu.wordpress.com/2013/09/01/introduction-2/ to see the full list. naduvil thiruvIdhip piLLai bhattar – life and glories in telugu – https://guruparamparaitelugu.wordpress.com/2015/05/07/naduvil-thiruvidhi-pillai-bhattar/ – new article by shashidhar swamy based on http://guruparamparai.wordpress.com/2013/04/20/naduvil-thiruvidhi-pillai-bhattar/ . Please visit https://guruparamparaitelugu.wordpress.com/2013/09/01/introduction-2/ to see the full list. 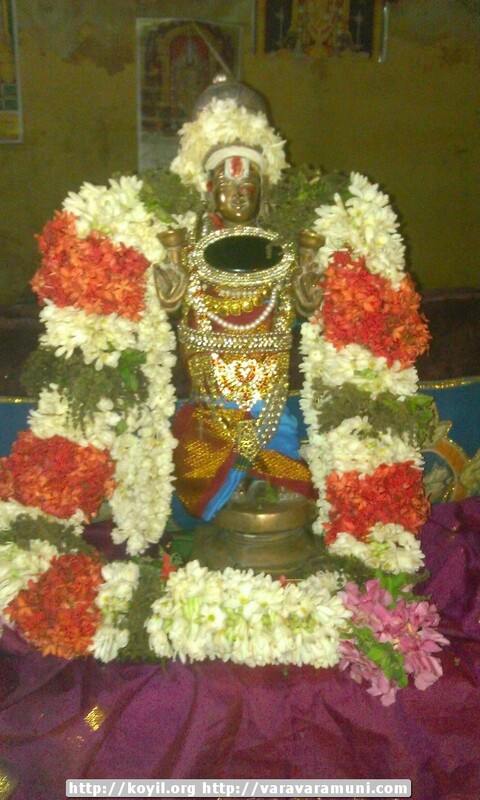 guruparamparai hindi – aruLALa perumAL emperumAnAr – life and glories in hindi – https://guruparamparaihindi.wordpress.com/2015/05/06/arulala-perumal-emperumanar/ – new article by vaishNavi ammangar based on http://guruparamparai.wordpress.com/2012/11/28/arulala-perumal-emperumanar/ . Please visit https://guruparamparaihindi.wordpress.com/2013/08/29/introduction-2/ to see the full list. 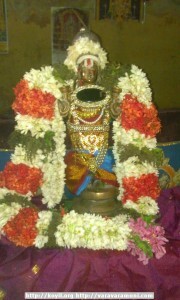 thiruppullANi – chithrai brahmOthsavam – vidAyARRi/relaxation (yesterday) – http://thiruppullani.koyil.org/?p=374. guruparamparai hindi – kidAmbi AchchAn – life and glories in hindi – https://guruparamparaihindi.wordpress.com/2015/05/05/kidambi-achan/ – new article by jAnaki ammangar based on http://guruparamparai.wordpress.com/2013/03/31/kidambi-achan/ . Please visit https://guruparamparaihindi.wordpress.com/2013/08/29/introduction-2/ to see the full list. 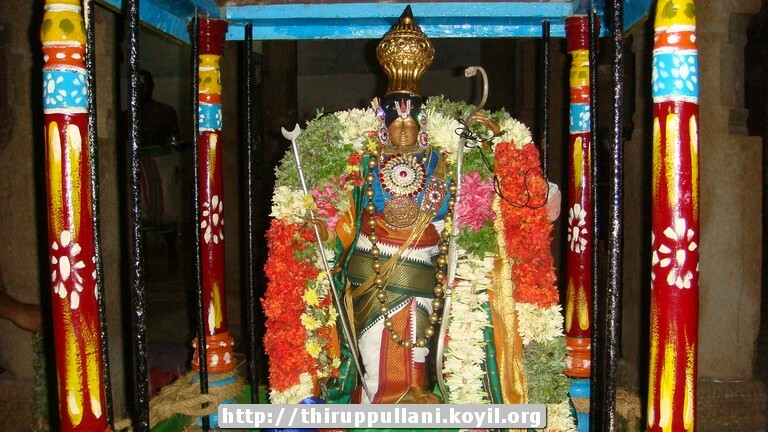 thiruppullANi – chithrai brahmOthsavam – days 9 and 10 (yesterday and day before yesterday) – http://thiruppullani.koyil.org/?p=374. gyAna sAram (English) – 40th pAsuram published at http://divyaprabandham.koyil.org/?p=2210 . Thanks to sundharavaradhan swamy for publishing the same. With this gyAna sAram is complete. 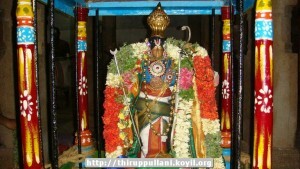 thiruppullANi – chithrai brahmOthsavam – day 8 (yesterday) – http://thiruppullani.koyil.org/?p=374. guruparamparai thamizh – mudhalAzhwArgaL (first 3 AzhwArs) – https://guruparamparaitamil.wordpress.com/2015/05/01/mudhalazhwargal/ – new article by lakshmi narasimhan swamy based on http://guruparamparai.wordpress.com/2012/10/22/mudhalazhwargal/ . Please visit https://guruparamparaitamil.wordpress.com/2015/03/14/introduction-2/ to see the full list. This entry was posted in Uncategorized on May 3, 2015 by Sarathy Thothathri.